How often do you find yourself in this scenario? It’s Monday morning and you’re all geared up for a productive week ahead. 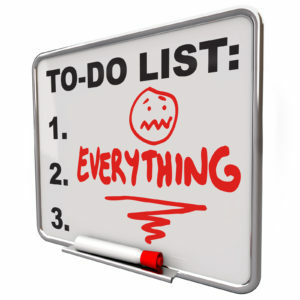 You’ve got your to-do list (massive as it is) at the ready and you sit down at your desk to start checking things off. As you begin to read down your list, you start to feel something in your gut. It’s not a physical pain necessarily, just a feeling of something heavy starting to grow. You ignore it and continue reading your list, making stars next to the things that seem to be the most important to get done that day. But the more you do this, the heavier that feeling gets, until it starts creeping up to your shoulders and finally settles in your head. All that enthusiasm you had when you first sat down is gone and the only thing you feel now is utter and complete overwhelm. Sound familiar? I’ve been there, too, so I understand. And it’s not that all the tasks on your list aren’t wonderful and/or doable. There are simply too many of them – and they all seem important right now – to expect that you can accomplish them all in the hours you have to work in any single day. So what happens? You do a little of this, a little of that, and you really never complete a single project! But you don’t have to let another week pass without really accomplishing anything. Simply create a Priority Card. A Priority Card will help you organize all your tasks in a way that will SHOW you every day what you should focus on. There are a lot of details that will threaten to take your mind off your priorities (this is where a virtual assistant can be of immense value), but those details are not necessarily what will move you forward in your business. To do that, you need to consistently focus on completing the projects that will move your business ahead big-time. You can create a system for helping you focus on your priorities in a number of ways, but I’m going to give you mine. I only work about 15 hours a week on my business, so adjust your own plan accordingly. At the beginning of each week, I choose 3 projects with looming deadlines (self-imposed as they may be) from my master task list (which really is so massive that it has its own notebook). For example, at the moment, I am working on a sales page, content for a program, and a new offer. Once I started using my Priority Card, my own business growth leapt forward ten times faster than when I was doing a little of this and a little of that, working on a dozen things, but taking much too long to actually complete just one project. Know you won’t be able to stick to this process 100% of the time, but even 80% will help you make dramatic strides in your business growth. You’ll actually finish the projects you set out to do, and you’ll not only feel great about doing so, you’ll be inspired to do it again, and again, and again. Once you make this shift, you’ve learned the secret to wiping out overwhelm for yourself and your business! Want to know more of my best tips for beating overwhelm and simplifying everything in your business so it’s less stressful and much more fun? Be sure to check out my Lively Biz Business Club – get on the wait list here.